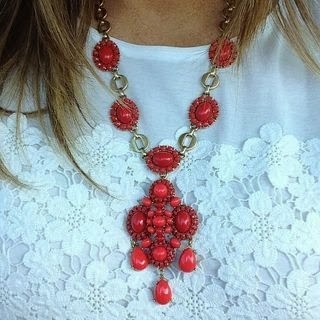 I saw this necklace on Stella and Dot's website. Isn't it pretty? Oh, so pretty! The $98 tag isn't so pretty, though. Maybe it will go on sale sometime? Here's hoping...I don't ever spend that much on jewelry. But this one would surely tempt me. This is my lovely daughter. She's seventeen and such a fashion cutie! She's been thinking of starting a blog and she would be great at it. I've mentioned before that she can grab several things off the rack that don't look like much to me, but then after she adds her accessories and her own style, she totally makes it all beautiful. She didn't get that from me, believe me! I think I learn things just from watching her. Can you tell I had to search a bit for this one? But since Valentine's Day is Friday, I had to try some red. My birthday is this week. I have to tell you that this birthday age was kind of hard. I feel like I'm getting so old sometimes! But then I think about my life and I have to say...it's the sweetest life. I have a wonderful husband, beautiful children, and a lovely home. I am blessed. I added in my profile on the sidebar that my life isn't perfect. We have two children with serious health issues. There are many days that I struggle with despair. Different things will trigger those emotions. For example, our daughter has cerebral palsy. It is always so hard for me when girls her age hit certain milestones like getting their driver's license and things like that. But I always have to remind myself of the character of God. He is kind. He is in this with me for the long haul. He daily gives me the strength to do the jobs that have to do. I have to choose to find the joy in the everyday. Sometimes I have to look really hard! But it is always there. My kids know how crazy I am about sunsets. Sometimes they will call me to the window if there is an exceptionally pretty one. That is kind of what I mean. Sometimes I look at the beauty of a sunset and know that the One who created it... painted it in the sky just for me (or you) to see that day. Usually, it's a day that I really need to see the beauty that God has made. For me, looking at beauty is like taking a long drink of something very sweet. It gives me strength. I bless your day today and ask the Lord to show you how much He values you. You aren't just a face among millions. He notices you and loves you. He longs to make Himself known to you. What a beautiful post. Your words about finding the joy in the everyday...I love that. I am so thankful for a God that loves me too! So glad I stopped by from The Pleated Poppy. P.S. I like your blog!